Close to 400 people gathered at Ripley for the candlelight vigil that honored Emmaleigh Barringer, the 10-month-old baby who passed away. RIPLEY, W.Va. — Close to 400 people came out to 100 North Court St. in Ripley to the candlelight vigil Monday as the community continues to mourn the death of 10-month-old Emmaleigh Barringer. Barringer died last week following what police have called a physical and sexual assault. The suspect in the case, Benjamin Taylor, 32, of Cottageville, has been charged with first-degree murder. The event was organized by the Court Appointed Special Advocates of Jackson County, also known as CASA, and began at 7 p.m. at the Jackson County Courthouse. The baby girl died on Wednesday at Charleston Area Medical Center. The vigil began with the Goldtown Community Church Choir singing a few songs as everyone was handed a lit candle. After the choir was finished, Pastor Stephanie Castle of the Ripley Church of the Nazarene opened the vigil with a prayer. Among the others who spoke were Kathie King, a CASA director in Jackson County; Grace Stewart, director of program services for the West Virginia Child Advocacy Network; the Rev. Matthew Ash, pastor at Parchment Valley Church in Ripley, and Pastor Mark Gerstell of the First Baptist Church of Ravenswood. The candlelight vigil also focused on the first responders and how important they are in times of crises in the community. “It is good that so many people from the community were able to come out to honor that baby girl and her family,” said Tammy Burcher of Ravenswood. The Heroes4Higher Batman, based in Huntington, spoke about the importance of child abuse awareness at the vigil. Batman, who was driving the HopeMobile, rode with Guardians Of The Children, a Christian motorcycle club. Guardians Of The Children also is dedicated to protecting the victims of child abuse. “Our alliances as bikers allow us the ability to call upon resources that might not generally be available to the public at large,” said a GOC representative. 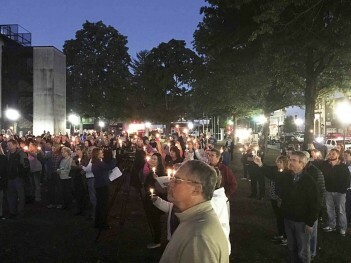 “This vigil shows that when we need to come together as a community we can without hesitation,”said Thomas McChater of Ripley. Emmaleigh Barringer’s family was present at the vigil but asked to not be interviewed or photographed by any media outlets and to have their privacy respected. See more from the Parkersburg News and Sentinel.